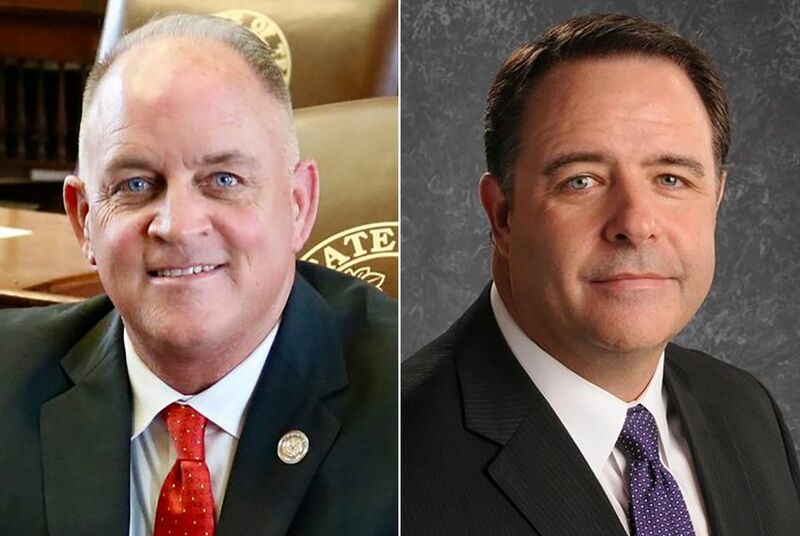 The battle lines in a rural Texas GOP primary race have centered on school vouchers and gun rights, as Jim Largent, a superintendent in Granbury, alleges that state Rep. Mike Lang hasn't properly represented his district. Nearly a year ago, a dozen right-wing lawmakers in the Texas House dubbed themselves the Texas House Freedom Caucus, railing against the chamber's more moderate leadership and highlighting divides within the state GOP. Now, in a wedge-shaped district southwest of Dallas-Fort Worth, a Freedom Caucus member is defending his hard-line approach to last year’s legislative sessions against a challenger who argues he ignored the needs of his district. Jim Largent, superintendent of Granbury school district, is the leading Republican challenging state Rep. Mike Lang, R-Granbury, whom Largent has repeatedly referred to on social media and in interviews as an "absentee legislator." “What I hear everywhere I go is that once Mike Lang was elected, we haven’t seen him,” Largent told The Texas Tribune, emphasizing his claim that the rural Texas district effectively did not receive representation in the state House last year. But Lang, a freshman legislator riding into his re-election bid with an endorsement from Gov. Greg Abbott and with support from his Freedom Caucus colleagues, brushed off his main challenger's criticism, responding on KXYL Morning News earlier this month that "there's a difference between being absent and understanding what's truly going on." A multitude of proposals at the Capitol last year fueled the fight over local control, including legislation backed by Abbott and Lt. Gov. Dan Patrick to limit how much property tax revenue local entities could collect without an election. Largent launched his campaign to unseat Lang in December on the last day candidates could file to run for office. A recent report he filed to the Texas Ethics Commission showed him raising $30,000 in the last few weeks of 2017. Lang reported raising $75,000 in the last half of the year. A third primary contender – retired teacher and U.S. Army veteran Greg Risse – did not file a fundraising report. Largent has made opposition to school vouchers — a proposal that would let Texas parents pay for private schools or homeschooling with taxpayer money — into one of the main pillars of his campaign. The issue, which Lang has supported some versions of in the past, has created battle lines that are often sketched along rural-urban lines rather than party ones. But Lang told the Tribune that constituents are more focused on opposing abortion and supporting gun rights, particularly "constitutional carry," which would allow Texans to carry firearms without a permit. Largent has said his support of a constitutional carry measure would depend on the details of the proposal. The race, like some others around the state, has also drawn attention as Republican circles speculate about who will replace San Antonio Republican Joe Straus as House Speaker. The departure of Straus, who announced in October that he will not seek re-election in the lower chamber, has pitted more conservative members who have opposed the speaker against more centrist Republicans ahead of the 2019 legislative session that will kick off with a vote among members on who next will hold the reins of the chamber. In response to a new era of House leadership on the horizon, the state party released a form in November asking Republican candidates to back whoever the House Republican Caucus picks for speaker in 2019. Lang signed that form, along with another pledging to support the state party's 266-item platform. Largent has so far signed neither and told the Tribune he’s hesitant to endorse the forms anytime soon. That position drew backlash earlier this month from the Hood County Republican Party. A​ll 10 of the precinct chairs on the party's executive committee at the time voted in favor of a “no confidence” resolution against Largent that questioned his Republican credentials, per county chairman Jim Logan. Largent, asked about the vote, called the group a small faction of the party that "lies and spreads hate about anyone they can't control." Whoever wins the Republican primary will almost assuredly win the general election in November, since no Democrats launched bids for the seat. And Lang, pointing to his votes and alliances amid the heat of primary season, expressed confidence he will draw the support he needs across the Republican-leaning district. Clarification: This story was updated to clarify the number of precinct chairs on the Hood County Republican Party's executive committee who voted in favor of a "no confidence" resolution against Jim Largent.